Deacon Patrick Pelkey is the Liaison for the Catholic Charismatic Renewal for the Diocese of Raleigh. Deacon Patrick was ordained in 2011 and is assigned to St. Michael the Archangel Catholic Church in Cary, NC. He and his wife Lynn have been married 40 years and have a son, two daughters and one grandson. Deacon Patrick and Lynn were first introduced to the Catholic Charismatic Renewal and the Gifts of the Holy Spirit in 1977 when Patrick was in the Air Force. They would gather in their home with other young couples for praise and worship and this experience changed his life. Deacon Patrick and Lynn have celebrated with several prayer groups in Maine, South Carolina, Alabama and North Carolina and he has helped lead several Life in the Spirit seminars. Deacon Patrick is a founding member and a core team member for the St. Michael’s Holy Spirit Ministries Catholic Charismatic prayer group which has been meeting since 2012. In addition to his diaconal responsibilities, Patrick is an Information Technology project manager for a large national bank. Patrick has been employed in this position for ten years and has over 25 years of IT project management experience in various industries. Maria Muratore was born and raised in New York. She attended St. John’s University, received a Bachelor’s degree in Finance and worked in banking in Manhattan before starting a family. Maria has always been an active practicing Catholic. She’s ministered in various capacities through the years. As a young adult, she attended The Amazing Grace prayer group and assisted at Healing Masses, Retreats, Seminars, Conferences and wherever there was a need. She assisted Youth Ministry at St. Gabriel’s Retreat House on Shelter Island, NY to counsel teenagers on retreats. Maria met and married Peter Muratore on April 7, 1991. Maria and Peter are blessed with two daughters, Nicole and Michelle. In 1995, Maria developed and led a young mother’s “Moms and Tots” group at Notre Dame Parish in New Hyde Park, NY. In the fall of 2000, Maria founded and led “The Queen of Peace” prayer group including smaller spin off prayer groups for children as well. Maria and her family moved to Cary, NC during the summer of 2009 and joined St. Michael the Archangel parish. Since then, Maria has served as a Catechist for Elementary Faith Formation, the Edge Middle School, as well as, the Teen Youth ministry. 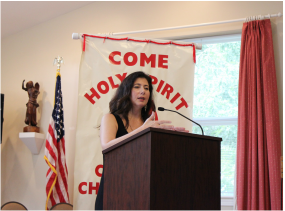 Maria has been a board member for Catholic Charismatic Services of the Diocese of Raleigh during the past five years. Maria is also a Core Team leader of the Jesus Is Lord prayer group at St. Andrew’s, as well as, a Core team leader of the Holy Spirit Ministries Prayer group at St. Michael's. Maria enjoys partnering, collaborating and edifying others to reach goals together. She is seeking to unify prayer groups within the Diocese creating fellowship and awareness of the gifts of Holy Spirit through conferences, Regional prayer gatherings, retreats, Life in the Spirit Seminars including Healing Masses and other events. Maria feels honored and blessed about being appointed and serving as the Catholic Charismatic Services Director for the Diocese of Raleigh.